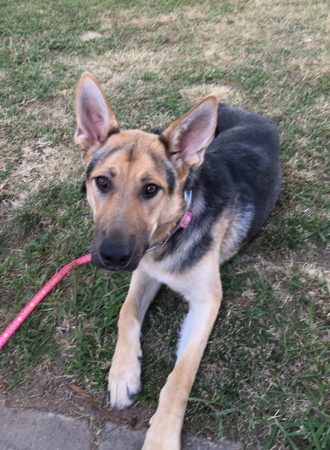 Melody is a very reserved, but completely adorable female GSD with a black and tan coat with cream colored undertones. She has striking facial marking and deep, soulful eyes. 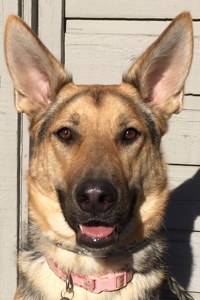 Although she came to us as an owner surrender from the Yuba shelter, we don't know much about her prior background. We estimate her to be approximately one year old. 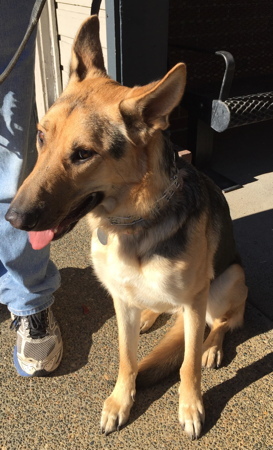 She weighs in at about 55lbs., with a slender, athletic build. This makes Melody a good fit for someone looking for a smaller GSD. Melody came to us as a VERY timid girl, easily frightened by almost any sudden moves or loud noises. Although she can still react in a skittish way when startled, her confidence has increased 10 fold over the last few months. Most of her timidity has been overcome thru counterconditioning, and working to build a calm demeanor. This has been helped by being around the stable, confident dogs in her foster home. Although Melody can still be a little timid around people (especially when she first meets someone) she has a sweet, affectionate nature that comes out once she gets comfortable with you. Because of her tendency to be reserved and cautious, she must go to a home with another dog, preferably an older male. She would likely be okay with a dog savvy cat. Small children, and noisy, busy environments, are not an option for this girl. Although she may be on the small size, Melody holds her own in playing with the much larger dogs she has been around in her current foster home. She will play tug, and has strong ball drive, and is very content to sit on a pad and chew on hard toys like Nylabones. She is mostly housebroken (only a few accidents in the house) and loves to run around both inside and outside with her foster pack. She has good basic leash manners, but is still learning and really enjoys neighborhood walks. She rides nicely in the car, and loves to hand out the window until and take in the sights. She seems interested in water play, and has dabbled in the pool in her foster home, but she has not yet actually tried to swim. Melody appears to have had has no formal training, but she has already learned sit, down, and wait. She is very praise motivated, and will work hard for treats. Whoever adopts her would do well to take her thru a full obedience training class to help bond with her. Melody is a real sweetheart to be around, and loves one on one time, as well as quiet evenings of family time. She goes easily into her crate at bedtime and settles nicely. This sweet little girl has a lot of love and affection to give, and will bring a lot of joy to the right forever home.